Hey there, it's Diana at Red Lotus Designz. Thanks so much for checking out my post! As this is my first time posting on itch.io, it will be a rather lengthy post, at best. 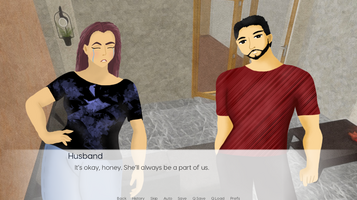 Moo Times of Betsy: Episode 1 was created during NaNoRenO 2019 and couldn't be any more excited to share this bite-sized episode with everyone. The series was based on an old web comic series that I've created on my website a while back (around 2011-2013). Because I lacked the motivation and the necessary drawing skills at the time, I ended up feeling discouraged and decided to halt the series. Many years later, I was introduced to visual novels while browsing on Steam and fell in love with the variety of stories that were released by indie game creators. At one point, I was convinced that I would not be able to code one and instead, decided to go through the non-programming route. After some trial and error, I decided that it was too clunky and didn't work out. I ended up coding the series using Ren'Py since it was a viable and easier option (considering that I do have previous experience in writing Python code back in the day). To my surprise, it was very easy to pick up and the documentation on the Ren'Py website was more than enough for me to get started on my visual novel game development journey. After some trial and error, I'm happy to say that I've developed a fully functional episode where it's playable on the Windows, Mac & Linux platforms. I want to thank everyone who has been supportive and encouraging throughout the process since day one of the NaNoRenO 2019 game jam. Character sprites and Betsy the cow sprites were created using Procreate with Apple iPad Pro and Apple Pencil. Background art was created through Planner5D and painted over through Brushstroke.